Week 2 of Ratatouille! We’re getting into some good French food this week. I got to cook sous vide for the first time! It was great! Lots of these recipes come from inside Gusteau’s restaurant. There are actually just a handful of actual food dishes shown in the restaurant. There are just a lot of instances of the few dishes. I guess they are the most popular. So hold onto your rat-tails! It’s time for some more Ratatouille! Also, if you haven’t had a chance to donate to our Patreon page, now is your chance to do it! We see a dish of a round pink thing served with veggies a few times. At first I had no idea what that could be. A chef friend suggested that it was Salmon Roulade. Sure enough, that seems to be right because they do mention salmon amidst the background kitchen nois. Now the most common way to cook roulade is with a sous vide cooker. Sous vide is a method of cooking sealed food in a water bath to a precise temperature. Usually when you cook food in an oven or pan, you have the oven or pan really hot and you cook the food until the internal temperature reaches a certain temp. With sous vide, you keep the surrounding atmosphere of the food a certain temp and the food is done when that temperature has permeated through all the food. Sous vide is a lot easier to cook with an actual cooker, but cookers go for at least $100, and that’s for the cheapest of cheap. But there are ways to do it without a sous vide cooker. Thats what I did. It is a LOT harder… and you have to constantly monitor the food and it isn’t as precise. But it can work…and boy does it make it tasty! To make brine, combine water sugar and salt. Whisk until it becomes clear. Place the salmon in brine, place in fridge and let sit for 20-40 minutes. Spread a ~18in long sheet of plastic wrap on a flat surface. 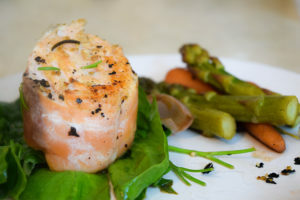 While the salmon is cooking, prepare sauce by adding the white wine and garlic into a sauce pan over a medium-high heat. Add the butter in until melted, then add in the olive oil. Whisk until it emulsifies. Once the salmon is done, cut each cylinder in half. Place each halved salmon roll in the pan, cut side down. Serve on top of the sauce mixture. 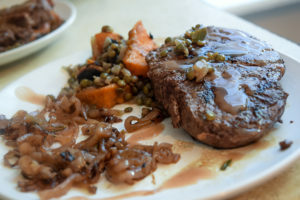 Another popular dish in the restaurant is this beef served on Sweet Potatoes and French Lentils. Place butter and shallots into a saucepan with pinch of salt; cook and stir shallots over medium-low heat until caramelized and browned, about 20 minutes. Add red wine and bring to a simmer. Reduce heat to low; cook until wine is nearly evaporated and pan juices are thick and slightly syrupy. Watch carefully, mixture burns easily. Add veal stock, return to a simmer, and cook until reduced by half and sauce is slightly thickened, about 10 minutes. Pour sauce through a fine mesh strainer set over a container. Tap the strainer with a spoon while straining and squeeze out the last remaining drops of sauce from the residue. Season sauce to taste with salt and black pepper. add the sweet potatoes and garlic. Spread potatoes and garlic on baking sheet and roast for 20 minutes, turning halfway. In a bowl, combine the garlic, potatoes, lentil mixture and mushrooms. This comes from a picture in the Anyone Can Cook Cookbook. 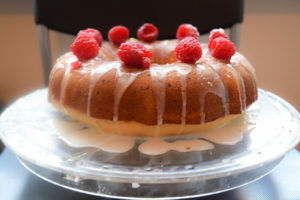 It looks like a bundt cake with a glaze and raspberries. Mine didn’t turn out as pretty, but it still was good. In a large bowl, cream the softened butter, lemon and sugar until fluffy, about 2-3 minutes. While cake is cooking, In a pan over low heat, add the powdered sugar. Cook for 5 minutes. Don't bring to a boil. Chill and drizzle over warm cake. Will it Help you Detect some Nuttiness? Man, this might be my favorite week. The salmon was the best salmon I’ve ever had. The filet mignon would have been great, but I overcooked it a bit…we can’t always be perfect.